Yet another example of the “deep opening sentence” or “profound historical generalization,” both of which seem to be among the aspirations of student writers. I encourage students to seek an opening assertion that both invites the reader’s agreement and opens the theme of the planned argument. For example, for an essay that will argue that a community garden should be permitted to remain even if that means less acreage for commercial development, a student might begin “The value of a piece of land cannot be adequately measured by its monetary worth.” From there the reader can be responsibly led through the specific subject and the “lens” or issue through which the writer is viewing the problem, to the thesis that the essay will support. But sometimes students mistake the idea of this “general subject” or “broad issue” statement and write instead a “deep opening sentence” or a “profound historical generalization,” as you see I call them. And then they write sentences like today’s example. Where is an essay that begins with this sentence going? It could go anywhere. 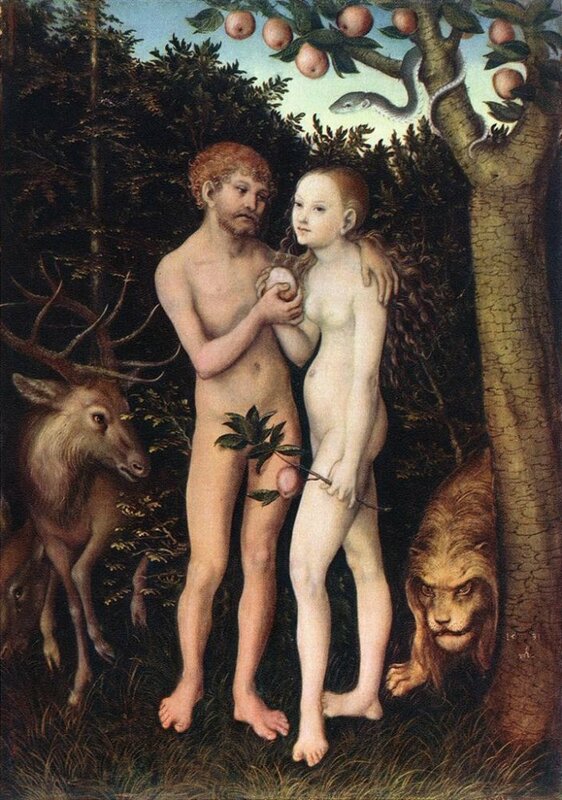 Lucas Cranach the Elder painted Adam and Eve a number of times. This one is in the Gemäldegalerie der Staatlichen Museen, Berlin, and can be found on numerous Internet sites. This sits alone in a margin of an old gradebook. I have no context for it, although another Horror a few pages later does mention a character in Equus, so maybe this student was also writing about that play, although I have never taught it in a course. I once had a student who built her assigned literature anthology on the subject of horses. This gradebook is from the University where I used that assignment. Perhaps, then, it is a statement from her anthology’s Introduction. In that case, it might have been one of those opening statements that offer the reader a quick and breathtakingly generalized vision of history. 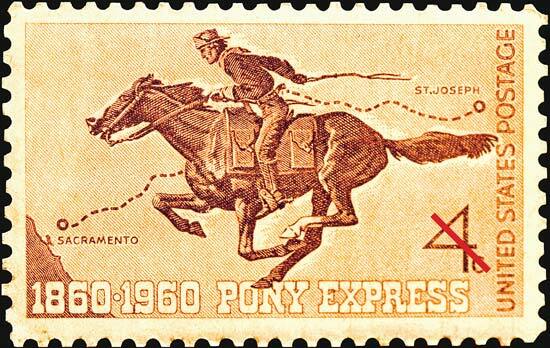 Did she then mean to observe that horses were not always domesticated but used to live free and wild? But many domesticated animals live in designated areas other than their human family’s own dwelling. Even back in the days when domestic animals lived under the same roof as their human family, they were segregated from the rest of the living quarters and were definitely not thought of as “pets” or invited to climb up on laps or sofas. Beyond this, I believe my student’s sentence needs no further comment. Let it stand as unembellished and unexplained. Enjoy imagining contexts for it, or picturing the many dimensions of strangeness that lurk beneath her serene observation. So begins a student essay on, if I recall correctly, the epic hero. It is a statement that, unfortunately, holds up pretty well, as generalizations go. Even the pickiest writing instructor can find little to quibble with here. Okay, maybe not so bad. We don’t have any eye-witness accounts, but as Darwin observed, nature is red in tooth and claw, and “man,” as just another piece of nature, can reasonably be assumed to fit into that observation. So: not necessarily proven, but certainly a reasonable assumption. The second sentence is rather awkward in word choice, but I guess we can say “violence happens,” so we could also say “violence has been happening”—although I’d argue that “acts of violence have been happening” would be a more legitimate way of phrasing it. There’s the Profound Opening. Sweeping generalization about distant history (“yore”), followed by an offered further application. Now, yes, acts of violence surely did “happen” before the “dawn of man,” unless you believe man arrived at the same time as all the other creatures, violent or otherwise. But if my student wanted to suggest that all creatures are violent, then why did he begin with his philosophical observation about people? And if he meant his observation about violence to be specific to people, why oh why did he have to go on to suggest that violent acts by people probably “happened” before the dawn of man? Doesn’t he equate “dawn” with “first appearance,” “beginning,” or “arrival”? Is “the dawn of man” just another way of saying “a long time ago”? The link at Profound-Openings Trap will take you to one of the other specimens I’ve saved. I really do appreciate students’ desire to begin an essay with an assertion that has gravitas or philosophical sweep. But they undermine themselves every time by reaching for something SO profound as to be ridiculous. And if the first statement isn’t ridiculous, they keep at it until it becomes ridiculous. How can this awareness be developed without squashing the high desire? I can sit with a student in my office and discuss the pitfalls of grandiose pronouncements, and I can help him realize the problems with the one he has committed; but with the next paper, there’s another one. What I hope is that eventually, as he continues to mature, my student will come to understand what is laughable in this kind of opening and learn to replace it with something he actually consciously means, before his audience is no longer his instructor in the privacy of her office, but professional colleagues at an important presentation he’s making, out there in the future. As we gather to enjoy the old traditions of this time of year, we may not realize that eating is one of those traditions—perhaps the oldest! It goes back to the beginning of time! That knowledge should also settle the age-old question “What did the first people eat?” or even “What did the dinosaurs eat?” Now we know: FOOD. Who says people and dinosaurs don’t have much in common? Adam and Eve and T-Rex probably sat down to many a food-feast together back in the Eden days. The first sentence of a discussion of the link between obesity and overindulgence in fast food, this is another student effort to invoke Yore. As I’ve noted before, students seem to find these quick-but-definitive historical pronouncements irresistible for opening statements. The one here is the single most profound, most resonant, most certain I’ve ever seen. And unlike many of the others, this one is also almost certainly true. Surely the writer can find common ground with the reader closer than the edge of the universe. More history, courtesy of my students. First of all, yes, I am so old that I still consider the word “media” plural. All my students think it’s singular. Perhaps acting in collusion the media might seem one mighty and single-minded behemoth; or perhaps it just seems like a singular word, like for instance “petunia.” Students who’ve never studied Latin don’t generally entertain the possibility that -a might be a plural ending; students who have studied Latin seem not to entertain the possibility either, or else they don’t expect a word in an English sentence to have a Latin ending. Who knows? But that’s just a nit-pick. I wouldn’t have copied my headline sentence for the sake of a Latin plural. It’s the history lesson that got me. I’ve commented before about students’ eagerness, yea compulsion, to offer some profundity about history before getting down to their actual subject. This might be fine enough, if they had a clearer view of history. The past is sort of a cartoon, though (it is for many of us, including me…but a big part of education is learning not to pretend to be knowledgeable where you aren’t!). Some of its features are distinct, but that doesn’t necessarily mean they’re accurate; other features are blurred, but that shouldn’t invite glib speculation. The term “media” may not have been with us in a big way before the advent of television, or scholars writing about television; but certainly those things we mean when we say “media” have been with us for longer; and even more certainly, those media have influenced politics. Just take a look at a 19th-century newspaper, or an eighteenth-century pamphlet, or a seventeenth-century broadside…or a Greek satire, for that matter. Probably among the hieroglyphics of the Pharaohs there were a few political cartoons. The individuals or associations that published their messages in these media were frequently doing their best to influence politics, and were often successful. My student may believe that objective reporting was the only form of mass communication in those blissfully innocent days that ended abruptly 45 years ago, but I’ve seen evidence to the contrary. She could have written a more credible sentence had she taken a moment to consider the possibility that human nature and human society haven’t really changed a whole lot. “The media influence politics” should have been her whole sentence (or, sigh, “the media influenceS politics”). If she’s going to go in for history, she might as well jump in and swim, instead of dabbling around with her big toe. Here’s another student’s compulsive history sketch-in. Why do they insist on doing this? Is it an effort to add a scholarly dimension to their comments, or some gravitas, or an air of authority? They just about never get the history right, undermining not only those hopes but also the credibility of whatever is going to come next. Surely there were more than two “known” religions in “the time of Jesus.” What about those Romans, for a start, bosses in the same neighborhood? We might even pick a nit or two and suggest that in the time of Jesus “Christianity” wasn’t a religion at all; Jesus claimed he was trying to purify or clarify the religion of the Hebrews, and most of his followers were Jews. Christianity as a cult, and then as a religion per se, developed after his death and resurrection. Is it just a function of my place in the history of the world that when I hear “come a long way” I think of Virginia Slims, those elegant cigarettes designed to grace a woman’s hand (and bring the lung cancer statistics into gender balance)? Oh, sorry, be that as it may…. My student is somehow implying that having only two “known” religions is rather primitive: we’ve “come a long way” by developing a lot more religions. But what then of all those religions the Old-Testament Hebrews were trying so hard to stamp out? Did the world go backwards in getting down to two? What does she mean? You’ll also notice the “in which” witch. Somewhere in the more recent past there must have been one hell of a teacher, pounding into thousands of student brains the notion that “which” cannot stand alone but always must be preceded by “in.” Even the Beatles had the notion “in this ever-changing world in which we live in.” I’m sure teachers were trying to teach no such thing: they wanted their students to stop ending sentences with prepositions, and so began conscientiously moving the “in” to stand before the “which” that usually lurked elsewhere in the sentence. But the students’ desire to put that beloved preposition at the end resulted in doubling it, putting one in front of the “which” and one at the end of the sentence. Now I even get sentences, like today’s, that require no preposition at all but throw “in” in front of “which” just the same. I also get sentences that use different prepositions but yet retain the “in”: “The college in which I went to,” for example. Maybe we need some ancient Hebrews to stamp that quasi-religious practice out! My student does seem to have no doubt as to where religions come from: the human race “develops” them. So much for divine visitations. Well, we’ve done a great job, and now we’ve developed a lot of them, a veritable holy smorgasbord for “various” people to choose from. Or from which various people can choose. I wish I had noted the actual subject of the essay from which this sentence came, because I can’t now imagine what point she might have been headed for. But I must I say I like her suggestion that the more religions, the better off the human race is, and her evident belief that there’s no problem which religion “various” people choose to follow. If only we could all be so broad-minded. It’s true, of course. We cannot really imagine ourselves living in just about time in the past. I remember when the “Second Woodstock,” or whatever they called it, was being planned, students of mine said they thought they would go, just to “see what it was like the first time.” They acknowledged that the weather might not be the same. I said the whole experience couldn’t be the same, because the people who were at Woodstock (I refuse to call it “the first Woodstock”) were living in the world of 1969; shaped by the events that preceded that year, they hadn’t yet had their lives and their perspectives affected by the events that followed. The people who might go to this one were shaped by those and ensuing events, and thus could never experience the innocent hopefulness and despair of 1969. I am on a listserv for people interested in clothing history and costuming; a number of the members are reenactors, and they would be the first to say that although period-perfect clothing, a period-appropriate setting, and a well-researched knowledge of the history, culture, and social mores of the time can open a window into the lives people led then, the reenactors can never fully imagine living in that time: they know what came afterwards, and that means they can only visit—just as Barbara Ehrenreich’s courageous year of living on minimum-wage jobs could give her an understanding of that kind of life, but since she was planning afterward to return to the “normal” of the life she actually lived, she wasn’t really experiencing blue-collar poverty as her life. Still, I knew what my student meant. Even English majors admit they cannot really imagine living in the times of the literature they study, beyond the moments of living in the text through the eyes of the writer. I hope that he was only commenting on the speed of communication. But he seems to be implying that seeing someone “face to face” is in and of itself a chore, an unimaginable burden, something to be avoided at all costs (“had to go”). And beyond that is a vision of his present that saddens me enormously. Out in what used to be the public sphere people walk, heads bent so they can text, or stride along talking full-voice to thin air (I occasionally think I’m being approached by an emotionally disturbed person, until I spot the head-mounted receiver). I go to the movies and sit with the few other people who venture out of their own homes to see films on large screens instead of on their televisions, computers, or cellphones. The aisles at Trader Joe’s still seem crowded, but it’s true that I also see PeaPod trucks in my neighborhood. With the price of gas one might expect fewer cars on the road as people turned more enthusiastically to public transportation or car-pooling, but I see just as many one-person-one-car voyagers in the traffic jams. No wonder the public discourse—especially the “comments” world of the Internets—is revealing such agoraphobia, or perhaps more accurately otherphobia: we are increasingly distrustful of our fellows, increasingly uncomfortable with “strangers”—increasingly willing to think the worst of them, to hate them. We seem, like my student, to find it hard to imagine seeing someone face to face—a way of life that he clearly characterizes as “more personal.” That’s some realization: that the more “individual” we become, and the more “connected,” the less personal life is! I’ve been more and more horrified by the policies and practices of the political party whose intention seems to be to take the country back to the Gilded Age, the good old days of 1880 and thereabouts. But the 1800s did get a few things right. One of them seems to be being “personal.” Most of the 1900s had that too, despite the spread of that late-1800s invention, the telephone. I am resolved today to “go see someone face to face.” Perhaps I’ll do it every day. If you do it too, people might think it’s a new form of the Alice’s Restaurant Anti-Massacree Movement. And maybe it is. I don’t have a lot of time for a blog today and actually was thinking about letting yesterday’s post ride, but then I opened my gradebook and saw a Horror on a back page—a Horror that almost completely speaks for itself—and decided something this perfect really couldn’t wait. The opening part of the sentence, above, couldn’t have made it into the Book of Horrors all by itself, but it’s nice enough to discuss briefly. I also like the idea that a man’s ignorance is being revealed piece by piece: Some ignorance, then a little more, then more…. Evidently our estimation of him does not improve on better acquaintance. But still, as I said, the sentence is not a true Horror. Fortunately for us, the student couldn’t resist going on. And like what did what use to be? I think we’re dealing with the unspecified “it” here, used the same way we’re using it when we say “it’s raining.” Asked for an antecedent we are left at a loss. But oh, I do wish my student had tried to find a noun. Probably the vagueifying effects of “this” were already setting in. All we know for sure is that “it” was like “that”everywhere. Does she mean this man’s ignorance was gradually being revealed everywhere? Various people’s ignorance was gradually being revealed? People were ignorant? The unspecified agent of proof or revelation was everywhere? I’m afraid she probably means things were rotten all over, in some particular kind of rottenness that she may have previously hinted at. And finally, in walks YORE: that unspecified, unclarified, undefined, undifferentiated PAST that students are always so eager to generalize about. “Back then.” Now, I’m ready to admit that the subject of the student’s paper probably suggested a time frame: if she was writing about slavery, for instance, or more specifically Frederick Douglass’ Narrative of the Life, then “back then” would probably mean the American 1800s; if just slavery, then maybe 1700-1863, or the world since the beginning of time…. If she was writing about a character in Julius Caesar, then “back then” might mean the English Renaissance/Elizabethan Era—or, of course, the first century B.C.E. Well, that’s good enough for me! p.s. I thought I had nothing to say about this one. I thought I would let it speak for itself. What can I say in my defense? “This just proves how things are nowadays”? Well, try to ignore me. Go back and read what my student wrote, and savor it in your own way while this beautiful sun shines down from this gorgeous blue sky on this breathtaking early-Spring morning.